This basket contains 8 various seasonal produce selections. 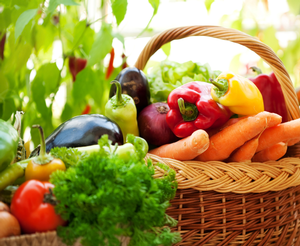 Baskets always include vegetables, fruit and greens (lettuce, kale, chard, etc.) with the occasional herb or sprout selection. Every selection is either Organic or Herbicide/Pesticide-free. Recommended for smaller families of 2-4 people.